Our mouths are full of bacteria. Hundreds of different types live on our teeth, gums, tongue and other places in our mouths. Some bacteria are helpful. But some can be harmful such as those that play a role in the tooth decay process. Tooth decay is the result of an infection with certain types of bacteria that use sugars in food to make acids. Over time, these acids can make a cavity in the tooth. Throughout the day, a 'tug of war' takes place inside our mouths. On one team are dental plaque—a sticky, colorless film of bacteria—plus foods and drinks that contain sugar or starch (such as milk, bread, cookies, crackers, candy, soda, juice, and many others). Whenever we eat or drink something that contains sugar or starch, the bacteria use them to produce acids. These acids begin to eat away at the tooth's hard outer surface, or enamel. On the other team are the minerals in our saliva (such as calcium and phosphate) plus fluoride from toothpaste, water, and other sources. This team helps enamel repair itself by replacing minerals lost during an "acid attack." Our teeth go through this natural process of losing minerals and regaining minerals all day long. How does a cavity develop in a tooth? When a tooth is exposed to acid frequently -- for example, if you eat or drink often, especially foods or drinks containing sugar and starches -- the repeated cycles of acid attacks cause the enamel to continue to lose minerals. A white spot may appear where minerals have been lost. This is a sign of early decay.Tooth decay can be stopped or reversed at this point. Enamel can repair itself by using minerals from saliva, and fluoride from toothpaste or other sources. But if the tooth decay process continues, more minerals are lost. 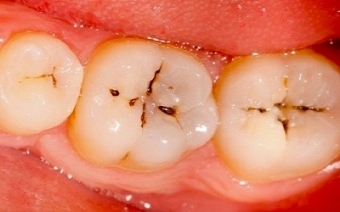 Over time, the enamel is weakened and destroyed, forming a cavity. Sugary liquids flow between the teeth and can cause cavities there. Sugary, sticky foods get stuck on the biting surfaces of the teeth and are more likely to cause cavities on those surfaces. Smooth Surface Cavities – Smooth surface cavities often form when sugary liquids flow between the teeth to reach the smooth surfaces. Root Cavities – Root cavities form on exposed tooth roots. Recession of the gums away from the teeth can expose tooth roots to plaque bacteria (oral biofilm) and sugars. Tooth roots are covered with cementum, a softer tissue than hard tooth enamel. Cementum decays more easily. It's common for people over 50 to have tooth-root decay. Pit and Fissure Cavities – Pit and fissure cavities often form when a person eats sticky or chewy foods that get stuck in the biting surfaces of the teeth. Dental sealants are another good way to help avoid a cavity. Sealants are thin, plastic coatings painted onto the chewing surfaces of the back teeth, or molars. Here's why sealants are helpful: The chewing surfaces of molars are rough and uneven because they have small pits and grooves. Food and bacteria can get stuck in the pits and grooves and stay there a long time because toothbrush bristles can't easily brush them away. Sealants cover these surfaces and form a barrier that protects teeth and prevents food and bacteria from getting trapped. Since most cavities in children and adolescents develop in the molars, it's best to get these teeth sealed as soon as they come in if the pits or grooves are deep. The first permanent molars — called "6 year molars" — come in between the ages of 5 and 7. The second permanent molars — "12 year molars" — come in when a child is between 11 and 14 years old. When our dentists examine your child's teeth, they will determine whether or not sealants are right for them. How can we help teeth win the 'tug of war' and avoid a cavity? Fluoride is a mineral that can prevent tooth decay from progressing. It can even reverse, or stop, early tooth decay. Fluoride works to protect teeth. It . . .
About bottled water – Most bottled water does not contain enough fluoride to prevent tooth decay. Diet is important in preventing a cavity. Remember...every time we eat or drink something that contains sugar or starches, bacteria in our mouth use the sugar and starch to produce acids. These acids begin to eat away at the tooth's enamel. Our saliva can help fight off this acid attack. But if we eat frequently throughout the day -- especially foods and drinks containing sugar and starches -- the repeated acid attacks will win the tug of war, causing the tooth to lose minerals and eventually develop a cavity. That's why it's important to be aware of how often we eat and what we are eating. Limit between-meal snacks. This reduces the number of acid attacks on teeth and gives teeth a chance to repair themselves. Save candy, cookies, soda, and other sugary drinks for special occasions or eat have them with a meal when your saliva is flowing to wash the sugars away and buffer the acids that cause cavities. Don't eat or drink anything with sugar in it after bedtime tooth brushing. Saliva flow decreases during sleep. Without enough saliva, teeth are less able to repair themselves after an acid attack. choose xylitol as a sugar substitute. It starves out the bacteria that can cause tooth decay. Disturbing the bacteria...before it has a chance to get together with the sugars in our diet, to form an acid...is the key to preventing tooth decay. Brush carefully to reach all tooth surfaces and especially, along the gum line and edges of crowns and fillings. Flossing or use of other 'between the teeth' cleaning aids is a must too. Ask our registered dental hygienists what they would recommend for you. ***'Secondary' or 'recurrent' cavities can form in the small spaces or gaps between the tooth and the margins of your dental fillings. Bacteria are able to thrive in these areas. That's why it's important to clean well around every part of all of your teeth and any fillings that you may have. Children's teeth should be brushed at least two times per day... preferably, after each meal. Supervise young children when they brush – For children aged 2 to 6, you put the toothpaste on the brush. Use only a pea-sized amount of fluoride toothpaste. Encourage your child to spit out the toothpaste rather than swallow it. Until they are 7 or 8 years old, you will need to help your child brush. Young children cannot get their teeth clean by themselves. Try brushing your child's teeth first, then let her finish. Floss your child's teeth for them. If your child's molars touch each other, be sure to floss them! Provide fresh fruit and vegetables, nuts, cheese, seeds and other nutrient-packed options that won't expose teeth to acids or sugar. Dentally, raisins are not the best choice because they stick easily in the grooves of children's little molars. It's best to avoid sugary/sticky snacks like pre-packaged granola bars with marshmallows and chocolate chips too. Limit or water down fruit juice, especially apple juice. Limit sports drinks which are sugary and acidic. Have the "Switch Witch" switch out your child's especially sticky and chewy Halloween candy for small non-candy treats. Permit your child to eat Halloween candy with meals when their saliva is flowing to wash those sugars away. Don't skip dental exams. Have us examine your child's teeth once or twice a year. Tooth decay can start as soon as children's first teeth appear. Missed School - Cavities lead to dental emergencies, pulling kids out of school early or forcing them to miss a day to get a filling. Lowered Confidence - Kids lose confidence when they're unhappy with their teeth. Healthy smiles help your children avoid bullying and feeling different from their peers. They may also be quiet and struggle to speak up because they want to keep their teeth hidden. Poor Tooth Development - Healthy baby teeth guide the growth of healthy permanent teeth. Trigger for Dental Anxiety - Every effort is made to ensure that your child's dental experiences are positive ones. However, dental anxiety which may lead to future avoidance of dental treatment, does exist. Tooth decay can lead to uncomfortable chewing and speaking for your child. Bacteria loves to sit on the rough surface of our tongues. Daily tongue cleaning reduces the overall level of harmful bacteria in the mouth. If there is less harmful bacteria in the mouth the chance of developing a cavity is reduced. A cavity always starts on the surface and then works it's way deeper into the tooth. Depending on the severity, cavities can be treated with fillings, crowns or root canals. If the damage is too extensive, the tooth may need to be removed. Suspect that you have a cavity? You may have a cavity if you experience pain, food gets caught in your tooth, your tooth feels rough to your tongue or it hurts to eat something cold or sweet. Cavities start out as small white spots on the teeth. If not addressed, they can gradually become darker and enlarge with time. Remember, cavities may start out small but they can expand or 'balloon' out under the surface as shown in the images above. If you suspect you have a cavity, please let us check it for you early on. FAQ - If I have a cavity, why don't I feel it? Tooth decay starts on the outer surface of the tooth. Often, it isn't until a cavity is large and has reached the deep, inner nerve in a tooth that person may feel it. Visit us at Lorne Park Dental so our dentists can do your thorough cavity check and set up a personalized prevention plan to help you stay cavity-free!